Patricia Templeton Sharp, DA, Glasgow School of Art, is a member of the prestigious Glasgow Society of Women Artists and an elected member of the Paisley Art Institute where her work has been exhibited and sold. She is a celebrated Scottish artist who works mainly in gouache and oils. Patricia’s paintings of landscapes and seascapes; flowers; still life and surreal, have been keenly bought and collected for several years for their beauty and for their artistic excellence. 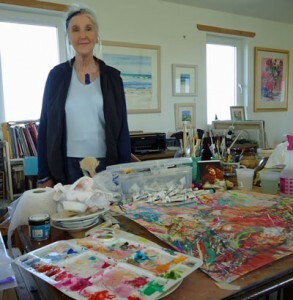 Patricia regularly exhibits in galleries in and around Glasgow and at her studio on the Inner Hebridean Island of Tiree, Argyll, where she paints and where she has many paintings in private hands. She previously worked from her studio in Glasgow and taught art privately while having successful one-woman exhibitions. Patricia’s art is a family affair as her son Graeme graduated BA (hons) in Fine Art at Glasgow School of Art in 1995. Patricia’s surreal paintings are executed by her to music, both classical and modern. She has had six of her paintings published as greeting cards.